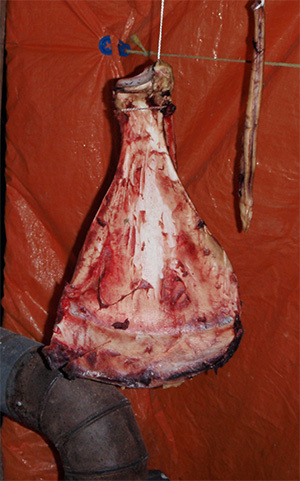 A good moose calling tip is to use an old shoulder blade to imitate an antler. This is one of the oldest tricks in the book, but do not be fooled to think that all you have to do is scrape a few trees and moose will magically come running to you. You must begin to think and act like a moose. It is true that you cannot call bull moose during the early season using estrus calls, but it is just as true that during the early season bull moose are attracted to one another. During the early season, and by the early season I mean any time before the rut, bull moose are trying to rid themselves of the velvet that protected their antlers while they grew. Use this to your advantage. When approaching your hunting area or when set up use your blade to imitate a bull rubbing his antlers. You do this by rubbing your blade up and down willow bushes or against tree bark. Make lots of noise, break some branches because moose are big animals and they make lots of noise too. Do not forget to listen... sometime after a bull moose hears another bull he will respond by one of two means, sometimes both. He may also thrash his antlers against a bush to let his rival know he is not alone. A bull may also grunt. He will not run away though, not unless he suspects you are not a moose. Moose Calling Tip: Dry out a shoulder blade and use it to mimic moose antlers. If you are on the move and walk slowly, continue to make thrashing noises as you go. If a bull moose is in the area you may be able to walk right up to him... why? Because he thinks you are a moose, therefore he does not need to be afraid. What do you do if you see a bull moose out in the open, but he is too far away? How do you approach without being seen? This is a great moose calling tip. Take that blade you have been using and hold it up in the air. Hold it as though it were an antler. As long as the moose does not smell you or notice something else amiss, you should be able to approach the moose. Walk slowly, pausing now and again to scrape a tree or bush. Rock back and forth as you walk. He will likely stand and watch you approach, wondering, who is this new kid on the block? Not everyone has a shoulder blade kicking around their garage, so what should a moose hunter do? I have seen hunters successfully use a canoe paddle to do the same, unfortunately they are a little cumbersome.